The academy promotes excellence and aspiration in everything its pupils do. The academy uniform is designed to reinforce this spirit of excellence. It is smart and practical, encourages pupils to take pride in being part of the academy and enables them to act as ambassadors for the Tong educational experience. The uniform is also designed to portray a professional and business-like image. Please see our sixth form standards page for details of the Post 16 dress code. We ask that all parents respect and support our uniform policy and send their children to school correctly dressed, in clothes that are clean, pressed and in good repair. We ask that you help to ensure your son/daughter is ready to learn unless and comes to school prepared. Bringing the correct equipment demonstrates positivity and excellence. Your son/daughter will need a black bag, pen, pencil, ruler and expected kit and equipment. In addition, a maths scientific calculator will be needed from year 7 onwards. 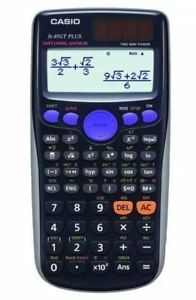 The academy approved calculator is a Casio FX85GT (Solar) Plus (see below). These can be purchased online or via the student support shop within school. Student Planner – Every student is given a planner which they must carry with them every day. The purpose of the planner is for students to plan their work and record achievements but also to ensure regular communication between parents/carers and the school.